Our walking outings have been providing a lot of bird sitings lately. On April 1, I reported that we saw what I thought was a flock of American Goldfinch. Further research in the bird book revealed that they were more likely Evening Grosbeak. I wish we had been able to get close enough to them to take some pictures. At the waterfront last week we saw two Hummingbirds and a pretty little brown bird I cannot identify. He was sparrow-sized, maybe slightly larger, quite evenly brown with a slightly crested head; very pretty. 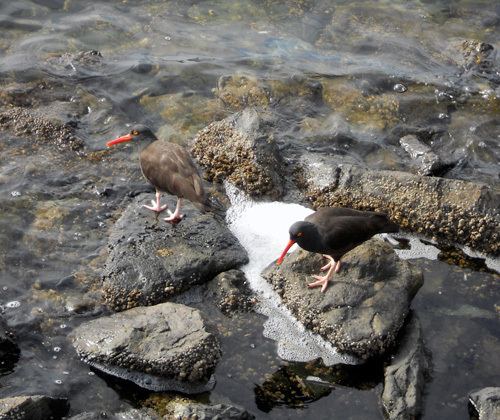 The coolest sighting lately were the two Black Oystercatchers in the picture below. We were very close to them and they weren’t bothered at all. Ah nature, even in the city it abounds. Black Oystercatchers in the Inner Harbour, Victoria BC. Very distinctive red beaks. What a nice picture! I love these birds….they look so inquisitive!